If you do a lot on the home screen, e.g. start screen the percentage of battery usage of the APP TouchWiz-Start is very high! If you end the application, and delete the even data you will lose all settings and you must arrange the Home screen again. Is the same as with Windows and the desktop icons. So, if you have more widgets on the home screen, and work very much on the home screen, the percentage of the battery usage is higher. (... see Image-1 Arrow-2) Tipp: Remove unnecessary things from Home Screen. It may also happen that one of the widgets, such as a weather app consumes too much of the CPU, or the application (app) hanging up. A restart of the smartphone often works wonders. PS: Do not turn off and turn on, please pres the restart button on the smart phone. (Image-1) TouchWiz-Start battery usage on my android mobile phone! Android - FAQ-5: TouchWiz Start high battery usage on my android smart phone, why? In the battery settings it shows the touchwiz home as the highest usage of my battery, help me? Help: Unfortunately, touchwiz home has stopped working is dis from high usage of battery and CPU!? Samsung s5 battery drain Lollipop from touchwiz, please help me? Battery draining with TouchWiz but not with Samsung Galaxy? I have Touchwiz-Start and battery problems on Samsung Galaxy Tab S? Can I replace the TouchWiz launcher on the Galaxy S5.? I can't turn off the Touchwiz on Samsung an Touchwiz drains batteries? 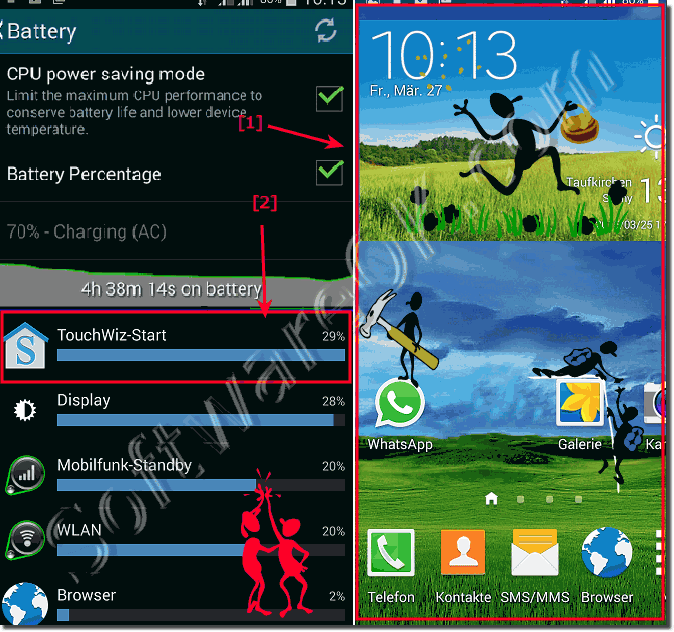 How to Reduce Battery Drain of Touchwiz on my Samsung Galaxy S3? Problems with the Samsung Galaxy Touchwiz how to fix them?